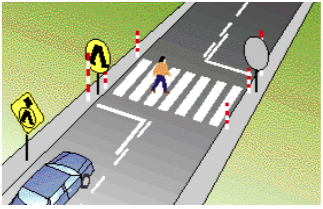 In this practice test you will be required to answer all 28 questions about pedestrians from the Driver Knowledge Test Question Bank. If there is any danger of a collision. When they are crossing from your right only. When they are crossing from your left only. Slow down and be ready to make a safe stop. Come to a complete stop before the crossing. Go faster, in case a pedestrian steps onto the crossing. Wait extra time to allow them to cross safely. Sound your horn to hurry them up. Drive around them so you don't hold up traffic. Which sign painted on the road tells you there is a pedestrian crossing ahead? Must not overtake the stopped vehicle. May overtake the vehicle if there are no pedestrians on the crossing. May overtake the vehicle provided no cars are coming the other way. Are off the crossing and the hand held sign is taken away. Reach the right-hand side of the crossing. Must obey the road rules. May not travel on heavy traffic roads. Must ride against the flow of traffic so they can be seen. Slow down, and be ready to make a safe stop. Sound your horn to warn them of your presence. Continue at the same speed and drive around them. One of the most common groups involved in road accidents. Unlikely to walk near the road and do not require your attention. Less dangerous than sober pedestrians because they are more careful after drinking. Slow down, watch for pedestrians and be ready to make a safe stop. Move into the left lane. Keep your eyes on the speedo. Slow down and watch for an indication that they will enter the road. Put your headlights on high beam so they can see you better. Increase your speed to avoid the chance of hitting them. Watch for pedestrians, animals and car doors opening. Drive in the right-hand lane, if there is one. Stay as close as possible to the vehicle in front of you. Watch out for pedestrians, who may hurry and take risks. Drive in the middle of the road to avoid splashing pedestrians on the footpath. 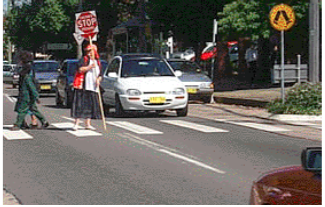 Stop and help aged pedestrians across the road. 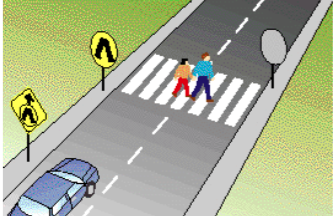 You may carefully drive through the crossing, if there is no risk of colliding with pedestrians. The traffic lights are out of order and pedestrians must not use the crossing. The green light is due. Do not proceed until the green light appears. You must give way to pedestrians if there is any danger of hitting them. Pedestrians have no special rights on the roads. You must give way to pedestrians only at marked crossings. You drive towards these people on the road. What should you do? Stop and give way if there is any danger of hitting them. Continue at the same speed and sound the horn. Slow down until they are half way through the crossing and drive on. 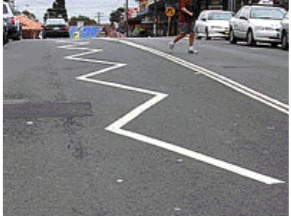 You see these zig-zag markings on the road in front of you. What do they mean? 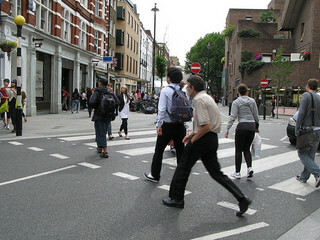 Take care and look out for pedestrians at a crossing. Look out for animals on the side of the road. Be careful because the road ahead is slippery. Places where pedestrians have special rights. Places where you can park. Places where special speed limits apply. Slow down or stop to avoid hitting the person. Slow down and sound your horn to hurry up the person. Maintain your speed and swerve around the person. Slow down and stop until the supervisor takes down the sign. Slow down and drive through giving way to the children. Stop and wait for the children until your lane is clear. Stop, wait for pedestrians to cross and for the green light to come on. Slow down and give way to pedestrians. Stop and continue after the pedestrians have crossed. Give way to the person if there is any danger of colliding. Slow down and sound the horn to warn the person to move back. Maintain your speed so you do not hold up the traffic. 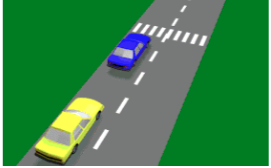 You must give way to pedestrians if there is a danger of a collision. Pedestrians must cross the road only at marked crossings and intersections. 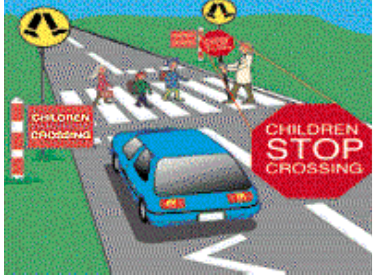 You do not have to give way to adults crossing at children's crossings. You should slow down and be more careful because they may move suddenly. You should reduce your speed by 5 km/h. You should ignore them and pay attention to the rear vision mirror. Slow down and take extra care because they may not see you until you are very close. Drive around them to keep the traffic moving. Sound your horn and keep going at the same speed so you do not hold up the traffic. 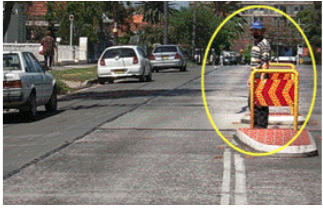 Look more carefully for pedestrians because they are hard to see. Keep your headlights on high beam all the time. Always drive in the right hand lane so you can be away from pedestrians. You drive up to a Light Rail vehicle that has just stopped at a tram stop. What is the most important thing you should do? Take extra care, slow down and give way to the pedestrians. Keep a look out for traffic coming in the opposite direction. Slow down, but keep moving so you do not delay other drivers. 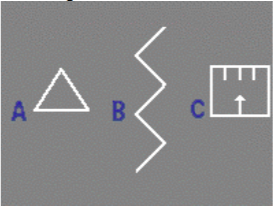 At all times, if there is any danger of colliding with them, even if there is no marked crossing. Only on marked foot crossings. Only on marked foot crossings and traffic light pedestrian crossings.